Last Friday, one of my favorite math and data science bloggers, Cathy O’Neil, served up a lazy and confused bit of market commentary that I find highly uncharacteristic of her normal thoughtfulness. 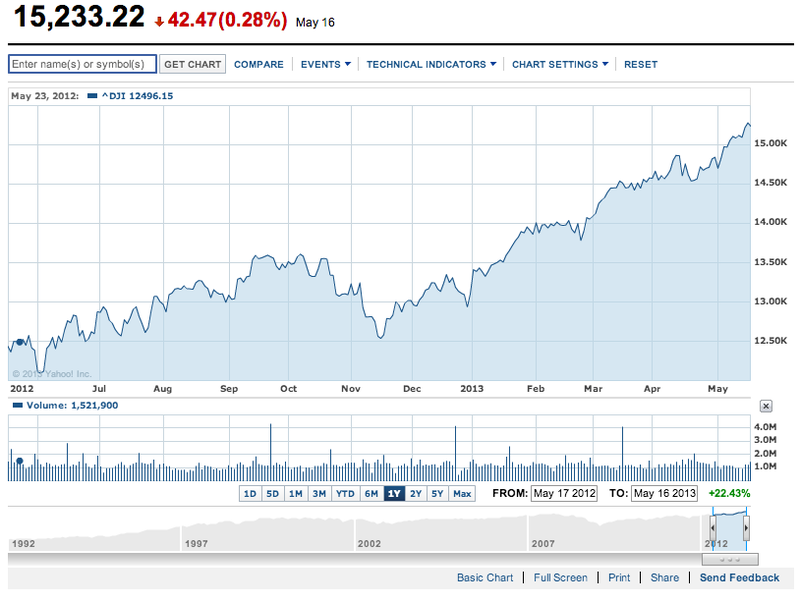 Let’s face it, the Dow is so high not because the economy is great, or even because it is projected to be great soon. It’s mostly inflated out of a combination of easy Fed money for banks, which translates to easy money for people who are already rich, and the fact that world-wide investors are afraid of Europe and are parking their money in the U.S. until the Euro problem gets solved. In other words, that money is going to go away if people decide Europe looks stable, or if the Fed decides to raise interest rates. The latter might happen when the economy (or rather, ifthe economy) looks better, so putting that together we’re talking about a possible negative stock market response to a positive economic outlook. Despite a significant amount of blogger hot air about how the Fed’s “easy money” policy artificially pumps up equity markets through various vague mechanisms—e.g. future inflation expectations—attempts at actually measuring QE’s effect has produced estimates ranging from a 10-15% boost in equities, and 100-125 basis point drop in bond yields. As the graph shows, US equity prices have risen far more rapidly than nominal GDP since 1990, but at least half of the gap is explained by the rise in the profit share. Over very long periods, the profit share has tended to be mean reverting, so this is a “fundamental” which may appear rather shaky. But the post-2000 rise in profits has been based on a combination of downward pressures on wages from global forces, and the weakness of demand for unskilled workers within the US domestic labour market. These factors may take a long while to disappear. The second force is the extremely low level of risk free interest rates. This is not entirely a “fundamental” force, since some if it is due to the operation of QE, which many investors will argue is an artificial device. Recent work by economists at Goldman Sachs concludes that QE 1, 2 and 3 have depressed bond yields by about 100-125 basis points. This therefore leaves a large part of the decline in yields to be explained by other more fundamental factors, including low inflation expectations, the global savings surplus and investors’ preference for safe assets . Evidence suggests that a little less than half of the decline in bond yields since 2007 has been due to QE, with the rest due to these other factors. Cathy’s second contention is that equity investors will put money in US markets because they are “safer” than European markets. This is a misunderstanding of an event-driven phenomenon called “flight to quality,” which typically takes place from equity to interest rate markets, or between interest rates markets—seldom between two equities markets. An example of flight to quality is that the relative US Treasury Bond yields are low compared to most other European countries. The “quality” in US Bonds is due to the fact that the US cannot default on its debt, while individual Eurozone countries can. There have been numerous flight events that have driven these differences over the past 4 years, mostly happening after a country’s decision with respect to macroeconomic policy or the ECB’s willingness to monetize debt. As you can see, the European equities markets are not losing ground to the US. Over in the comments section of her original blog post, Cathy still seems confused with what it means for a market to be “meaningful” for the “average person.” She links to an article by Megan Greene titled Europe’s Economies and Markets Have Divorced, which puts forth the argument that slow current quarter GDP growth in European countries implies that equities markets are greatly overvalued. This is laughably poor analysis of market prices. 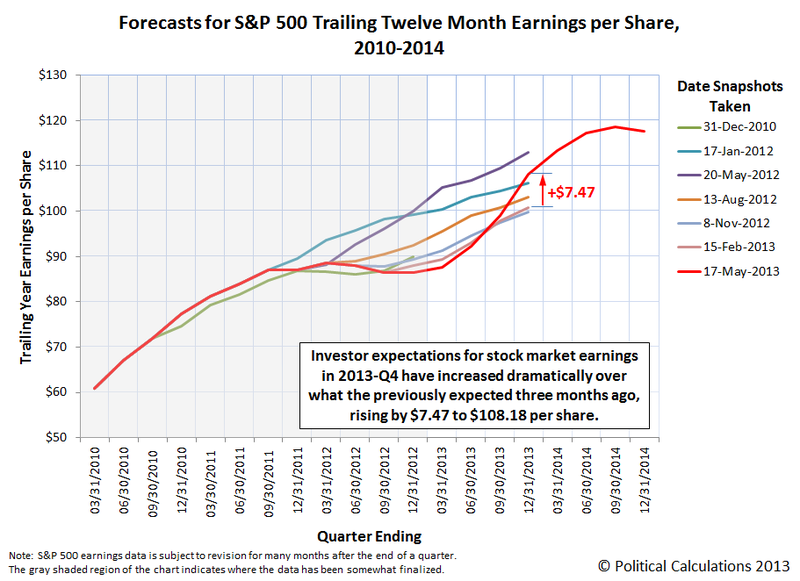 As you can see, the market is strongly correlated with higher future earnings expectations. The argument that “it is decoupled from reality” or that “it doesn’t matter” is argument from ignorance—in that O’Neil and Greene seem utterly befuddled to make sense of the current price level, and so they conclude that the market does not make sense. But I’ll invoke Occam’s razor and say we should consider the much more reasonable argument that the market reflects expectations of the future. I’d like to point out a quick example of how unchecked opposing world views can lead to bias and hypocrisy. Last year, O’Neil wrote a post titled Economists Don’t Understand The Financial System in which she criticizes economists for being “so high on their clean, simple economic models of the world… that they focus on the model to the exclusion of the secondary issues.” So why then does she blindly cite an economist’s poor, simplified model of market prices? Possibly because she hates capital markets participants more than she loathes economists. Unfortunately, many popular bloggers have both a bias toward content generation, as well as a very thin skin when it comes to criticism. Faced with the simple fact that she was entirely wrong, O’Neil would have accepted any support for her preconceived world view. This was a classic case of confirmation bias. Instead of letting the greater hatred take precedence, when she found this model, she should have flagged this situation and asked herself: why do I agree with this person’s model when I already hold the belief that this type of person makes bad models? There’s a popular phrase making rounds on science-oriented blogs this month: a little knowledge is a dangerous thing.